The Chihuahua is the smallest of all purebred dogs, maturing at 6 pounds or less. 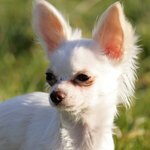 If a Chihuahua isn't quite your cup of tea but you're looking for a similar -- and slightly larger -- breed, you have numerous choices. The American Kennel Club's toy group includes several small breeds that may fill the bill. Chihuahuas appear in short- and long-haired varieties, and the papillon somewhat resembles a long-haired Chi. Like the Chi, the papillon is a bright little dog, but usually has an overall better temperament than the Chi. The AKC describes the papillon as "happy, alert and friendly." The breed receives its name from its telltale "butterfly" ears. Papillons mature between 8 and 11 inches at the shoulder, and weigh between 3 and 12 pounds. The Chinese crested appears in two versions -- hairless and powderpuff. The latter type sports a silky, soft double coat. If you choose the hairless type -- who has hair on the head, feet and tail, but not the body -- you must take care that your dog doesn't sunburn. This friendly canine matures between 11 and 13 inches tall, weighing 10 to 13 pounds. The miniature pinscher resembles an athletic Chihuahua. The AKC describes the breed as "fearless, fun-loving and proud." The min pin, as they're commonly called, requires more exercise than the average toy breed, so he's a good choice for the person who wants a small canine game for long walks or jogging. Min pins mature between 10 to 12.5 inches in height, weighing 8 to 11 pounds. Although not true terriers, Chihuahuas tend to be terrier-like in temperament. The toy fox terrier is both a small dog and a genuine terrier, with all the pluses and minuses of the type. He's very loyal to his person, and his short hair requires little grooming. He's a smart, alert, active little dog. The toy fox terrier stands 8.5 to 22.5 inches tall when full-grown, weighing 4 to 9 pounds.